This Lease (“Lease”) is made by and between COMMERCIAL PROPERTY LANDLORD, INC., a __________________ corporation (“Landlord”), and AGREEABLE TENANT, INC., a _________________ corporation (“Tenant”). 1.1 Date: This Lease is dated for reference purposes only this _______day of _____________, 20_____. The above terms are incorporated in this Lease and made a part hereof. 2.1 The terms defined in this Article 2 shall, for all purposes of this Lease and all agreements supplemental hereto, have the meaning herein specified unless the context otherwise requires. (A) “Office Complex” shall mean the Building, together with all appurtenant plazas, subgrade areas, any and all garages, parking and landscaped areas, pedestrian walkways and patios, sidewalks, loading areas, service corridors, restrooms, stairways and all other improvements made or appurtenances to the property described in Exhibit “A” attached hereto. (ii) In the event improvements are being made to the premises as provided in Exhibit “C” prior to Tenant's occupancy, the date upon which the Leasehold Improvements have been substantially completed as determined by Landlord’s project architect or manager (except that if completion of the Leasehold Improvements is delayed by design decisions, revisions, or additional work of Tenant or its agents, then the Commencement Date as would otherwise be established shall be accelerated by the number of days of such delay). Landlord estimates such completion will be made on or before the date specified in Section 1.4 (A). (iii) In the event the premises are not being improved prior to Tenant's occupancy, the Beginning Date specified in Section 1.4 (A) hereof. (C) “Total Building Area” is the total gross leasable area of the Building. (D) “Term” shall mean the Term of the Lease as specified in Article4 hereof. (E) “Proportionate Share” or “Pro Rata %” shall be that percentage or fraction the numerator of which is the Net Retable Area of the demised premises and the denominator of which is the total amount of Net Retable Area in the Building. Such share as of the commencement of the Term hereof is specified in Section 1.8. (F) “Leasehold Improvements” shall mean the aggregate of the work done in accordance with the work letter agreement, which agreement is attached hereto, as Exhibit “C”, in the event the premises are being improved prior to Tenant's occupancy. (G) “Real Estate Taxes” shall mean and include all general and special taxes, assessments, duties and levies, charged and levied upon or assessed by any governmental authority against the Office Complex including the and, the Building, any other improvements situated on the land other than the Building, any Leasehold Improvements or other improvements to the premises, fixtures, installations, additions and equipment, whether owned by Landlord or Tenant; except that it shall exclude any taxes of the kind covered in Section 8.1 hereof to the extent the Landlord is reimbursed therefor by any lessee in the Building. Real estate taxes shall also include the cost to Landlord of contesting the amount, validity, or the applicability of any taxes mentioned in this section. 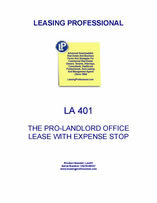 Further included shall be general and special assessments, license fees, commercial rental tax, levy, penalty or tax (other than inheritance or estate taxes) imposed by any authority having the direct or indirect power to tax, as against any legal or equitable interest of the Landlord in the leased premises or in the Office Complex or on the act of entering into this Lease. Further, if at any time during the Term of this Lease the method of taxation or assessment of real estate or the income therefrom prevailing at the time of execution hereof shall be, or has been altered so as to cause the whole or any part of the taxes now or hereafter levied, assessed or imposed on real estate to be levied, assessed or imposed upon Landlord, wholly or partially, as a capital levy, business tax, permit or other charge, or on or measured by the rents received therefrom, then such new or altered taxes, regardless of their nature, which are attributable to the land, the Building or to other improvements on the land shall be deemed to be included within the Term “Real Estate Taxes” for purposes of this section, whether in substitution for, or in addition to any other real estate taxes, save and except that such shall not be deemed to include any enhancement of such tax attributable to other income of Landlord. (H) “Operating Costs” means the total amounts paid or payable, whether by Landlord or others on behalf of Landlord, in connection with the ownership, maintenance, repair, and operations of the Office Complex (including, without limitation, all areas and facilities within the exterior boundaries of the Office Complex) as determined by standard accounting procedures. Operating Costs shall include, but not be limited to, the aggregate of the amount paid for all fuel used in heating and air conditioning of the Building; the amount paid or payable for all electricity furnished by Landlord to the Office Complex (other than electricity furnished to and paid for by lessees by reason of their extraordinary consumption of electricity); the cost of periodic replacement of fluorescent fixtures; the amount paid or payable for all hot and cold water (other than that chargeable to lessees by reason of their extraordinary consumption of water); the amount paid or payable for all labor and/or wages and other payments including cost to Landlord of worker's compensation and disability insurance, payroll taxes, welfare and fringe benefits made to janitors, caretakers and other employees, contractors and subcontractors of Landlord (including wages and all fringe benefits of the Building manager) involved in the operation, maintenance and repair of the Office Complex; managerial and administrative expenses related to the Building, the total charges of any independent contractors employed in the repair, care, operation, maintenance, and cleaning of the Building; the amount paid or payable for all supplies occasioned by everyday wear and tear; the costs of climate control, window and exterior wall cleaning, telephone and utility costs; the cost of accounting services necessary to compute the rents and charges payable by lessees of the Office Complex; fees for management, legal, accounting, inspection and consulting services; the cost of operating, repairing and maintaining the Building elevators; the cost of porters, guards and other protection services; the cost of establishing and maintaining the Building's directory board; payments for general maintenance, operation, replacement and repairs to the plant and equipment supplying climate control together with all salaries, fringe benefits or expenses for engineers for the maintenance, repair, replacement or operation of the Building or equipment located therein; the cost of supplying all services pursuant to Article 13 hereof to the extent such services are not paid by individual lessees; depreciation of the costs, including repair and replacement, of all maintenance and cleaning equipment and master utility meters and of the costs incurred for repairing or replacing all other fixtures, equipment and facilities serving or comprising the Office Complex (including the heating, ventilating and air conditioning and climate control systems serving the Building) which by their nature, require periodic or substantial repair or replacements, and which are not charged fully in the year in which they are incurred, at rates on the various items determined from time to time by the Landlord in accordance with sound accounting principles; and the net cost and expenses for insurance for which Landlord is responsible hereunder or which Landlord reasonably deems necessary in connection with the operation of the Office Complex. Operating Costs shall also include any Real Estate Taxes as defined in Section 2.1(G) hereof. Operating Costs shall also include, without limitation, the repair and replacement, resurfacing or repaving of any paved areas, curbs or gutters within the Office Complex, and the repair and replacement of any equipment or facilities serving or located within the Office Complex. (I) “Base Operating Cost” means the sum of ______________ Dollars ($___________). (J) “Lease Year” means any calendar year, or portion thereof, following the commencement hereof, the whole or any part of which period is included within the Term. (K) “Building” shall mean the office Building which contains the premises. (2) as to a floor only a portion of which is leased by Tenant, the aggregate of the net usable area of the portion of the floor occupied by Tenant, plus the result obtained by multiplying the area of the common area on such floor times a fraction, whose numerator is the net usable area of Tenant's portion of the floor and whose denominator is the net usable area of all tenant space on such floor. (M) “Net Usable Area” shall mean all floor area in a tenant space, measured to the inside glass surface of outer Building walls, to the corridor side of corridors and other permanent partitions, and to the center of partitions that separate the tenant space from adjoining tenant spaces, without deduction for columns and projections necessary to the Building. (N) “Common Area” shall mean the total area on a floor consisting of rest rooms, janitor, telephone and electrical closets, mechanical areas, and public corridors providing access to tenant space on such floor, together with the lobby or lobbies located in the Building, and all other areas available for the nonexclusive use by any Lessees in the Building. 3.1 The Landlord hereby leases to the Tenant, and the Tenant hires from the Landlord a portion of those certain premises with appurtenances, generally situated as specified in Section 1.3 (A) hereof and more particularly described in Exhibit “A” attached hereto and made a part hereof. 3.2 The portion leased herein is delineated on Exhibit “B” which is attached hereto and made a part hereof by reference; the Net Rentable Area of the premises is specified in Section 1.3 (B) hereof. The portion leased here unto the Tenant is hereinafter referred to as the “demised premises”, “leased premises”, or “the premises”. Tenant acknowledges that Landlord shall have no liability, nor shall Tenant have any right of Termination, in the event the Net Rentable Area of the premises is less than the amount specified in Section1.3 (B) hereof. 3.3 In the event Tenant's premises occupy less than three thousand (3000) square feet, Landlord shall have the right, at any time during the Term hereof, upon not less than ninety (90) days prior written notice to Tenant, to substitute for the premises such other space in the Office Complex as shall be substantially the same size as the premises (“the substituted premises”), provided that Landlord shall pay all expenses of Tenant incidental to Tenant's relocation to the substituted premises and that Landlord shall improve the substituted premises for Tenant's use and occupancy at least to the same extent as the premises occupied by Tenant prior to such relocation. 4.1 The Term of this Lease shall commence on the Commencement Date, shall expire on the expiration date specified in Section 1.4 (B) and shall be for the number of months specified in Section 1.4 (C) hereof, plus any partial month immediately following the commencement hereof. 4.2 After delivery of the premises to Tenant, Tenant shall, upon request from Landlord, execute a written acknowledgement of the Commencement Date and other matters in the form of Exhibit “D” attached hereto and incorporated herein by reference. 4.3 Option to Extend. Tenant, at its option, may extend the Term for one (1) separate and additional period of five (5) years (Extended Term), subject to Section 4.4 below. The Extended Term shall be on the same terms and conditions (except for minimum rental and as otherwise provided herein) set forth in this Lease. The option to extend shall be exercised by Tenant giving written notice to Landlord at least 270 days prior to the expiration of the Term. Upon such exercise, this Lease shall be deemed to be extended without the execution of any further instrument. Term shall refer to the Term of this Lease as so extended. 4.4.2 At the time Tenant attempts to exercise an option to extend pursuant to this Lease, Tenant shall not be in default under this Lease, or if in default, shall not fail to cure such default after notice and expiration of the applicable cure period. 4.5 Effect of Failure of Conditions. If any of the foregoing conditions are not met, then any attempt by Tenant to exercise an option to extend hereunder shall, at the election of Landlord, be null and void and this Lease shall terminate on the expiration of the Term. Further, if Tenant is in default on the date an Extended Term is to commence (beyond any applicable cure period), at Landlord's election, such Extended Term shall not commence and this Lease shall terminate on the expiration of the Term. 4.6 Rent During Extended Term. The minimum rental during the first year of the Extended Term shall be the fair-market rent of the Premises as Tenant and Landlord shall reasonably agree, but in no event less than the Minimum rental payable immediately prior to the Extended Term. If Landlord and Tenant are unable to establish the fair-market rent prior to thirty (30) days in advance of the commencement of the Extended Term, the fair-market rent shall be determined by a single certified MAI real estate appraiser (Appraiser) jointly selected by Landlord and Tenant. If they cannot in good faith agree to a single Appraiser by commencement of the Extended Term, the fair-market value shall be determined by a majority of three Appraisers, one selected by Landlord, one selected by Tenant, and one selected by the two previously selected Appraisers. After commencement of the Extended Term, Landlord and Tenant each shall give notice of its selection of a Appraiser to the other party. If either Landlord or Tenant fails or refuses to select an Appraiser within fifteen (15) days after receipt of written notice of the other party's selection of an Appraiser, the fair-market rent shall be determined by the single Appraiser selected. The Appraiser (or Appraisers) shall determine the fair-market rent as soon as possible. If a majority of the three Appraisers are unable to agree upon the fair-market rent within thirty (30) days after the appointment of the first Appraiser, the fair-market rent shall be an amount equal to the average of the three values determined by the Appraisers, excluding any fair-market rent which is ten percent (10%) greater than or ten percent (10%) less than the middle value. As used herein, fair-market rent shall mean the price that a ready and willing tenant would pay as Minimum rental to a ready and willing landlord if the Premises were offered for lease on the open market for a reasonable period of time and shall be the product of the fair-market monthly rental rate per rentable square foot multiplied by the rentable area of the Premises. The fair-market rent shall be determined by (a) the quality, size and prestige of the Premises, including all improvements to the Premises, (b) recent monthly rental rates for buildings of similar quality, size, and location in the ____________ markets, (c) the duration of the term, and (d) the financial strength of the tenant and any guarantors. Landlord and Tenant each shall pay for the Appraiser so appointed by such party, with both Tenant and Landlord jointly paying for any jointly appointed Appraiser. Until such determination of the fair-market rent, Tenant shall continue to pay the Minimum rental immediately payable prior to commencement of the Extended Term. The minimum rental determined by appraisal as provided for herein shall be subject to increase twelve (12) months following the first day of the first full month after commencement of the Extended Term and every twelve (12) months thereafter pursuant to Section 7.2 (a), but references to the Beginning Index shall refer to the last month prior to the commencement of the Extended Term hereof.